Youth baseball season is in full swing at Sam Wise Youth Sports Complex. 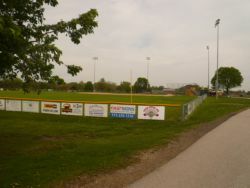 Located on the eastern edge of Altoona, its the home of both the Altoona Baseball League and the Greater Altoona Girls Softball Association. You won't strike out watching a game of either the littlest t-ball players or the oldest team playing a tournament game. Or on a windy day, head up to the large green space next to the ball fields for the perfect kite-flying space in town! This park also serves a Vietnam War Memorial with a model of an A-7 fighter jet located on the west side of the park.